Shirts With Random Triangles: West Virginia places CB Daryl Worley on indefinite suspension. 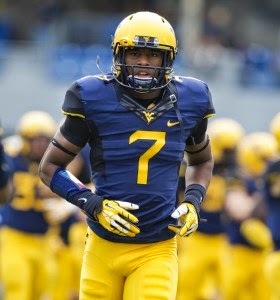 West Virginia places CB Daryl Worley on indefinite suspension. Daryl Worley. Photo via wvmetronews.con. West Virginia has placed cornerback Daryl Worley on indefinite suspension for the ever-vague "violation of team rules." No details were given for the suspension, and from the very brief press release on the matter, it would seam Mountaineer head coach Dana Holgorsen isn't really in a talkative mood anout the situation. "West Virginia University Football Coach Dana Holgorsen announced tonight that sophomore cornerback Daryl Worley has been suspended indefinitely for a violation of team rules. Holgorsen will have no further comment at this time." Worley was West Virginia's third-best tackler so far in the 2014 season.